whimsical whatnots and whatever...: Happy 47th Anniversary Manels!!! Manels gives back to its customers. Happy 47th Anniversary Manels!!! Manels gives back to its customers. Sales attract me like a bee inclined to be attracted to pollen. Manels had a private sale for bloggers last Monday - I was excited! They are having a 5 DAY SALE!!! All their items from their shoes, to bags & accessories will be on sale at 50% at ALL their BRANCHES! Plus, customers who purchase more than five items will also be given a 55% off their transaction. I recommend shopping with your friends and family members to avail of this promo. Shopping is a great way to bond with people. LOL! NOTE: The Manels Anniversary Sale runs from July 13 to 17 only! The Manels Nation aims to make ALL our customers a part of their advertisements. Yes, that means you, you, the person next to you, your brother sister, any relative by consanguinity or affinity and all persons including me can all be a part of their posters/advertisement! 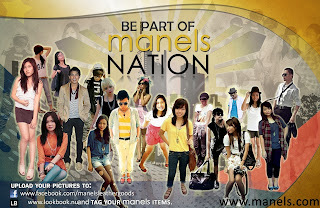 I know most people want to model, Manels is giving all customers a chance to be a part of their ads! Do you fancy seeing yourself in a poster? What are you waiting for? Post your pictures with their products on their Facebook to get a chance to be featured in their posters/campaign! Manels says: "Among competitors, we believe that we've remained true to our roots as proudly Pinoy. The Manels Nation campaign positions Manels as the "National Leather Goods". What better way to do this than utilizing today's available tools through social networks and fashion websites. Each customer now has the chance to get featured online and in our stores by posing with their Manels items and uploading these pictures through our Facebook page and Lookbook.nu. After your purchase today, we'd like YOU to become part of Manels Nation as well! :)"
Me and Charles were immediately brought down to memory lane by these shoes. Still cute adorable in a candid shot is she not? I can think of a dozen outfits that will look good with any of the wedges above. Who doesn't like animal prints? I want any of the shoes in the picture! Once again my big foot triumphed over me and none of the shoes fit me. I do understand though, extremely large feet like mine only happen in my family are very rare so it's not advisable for companies to manufacture big sizes. Filipinos are not known to have big feet, no? These bags have a lot of room space inside. Bags + shoes what more can ladies ask for? Kai, Jen, Charles and me. with VP of Operations/owner, Mark Siggaoat. Mark is a great host! He welcomed everyone with a warm smile and saw to it that all our needs were attended to. with my sister, Enky, Mark and Charles of wickermoss. Happy 47th Anniversary Manels! Keep up the good work for the next 47 years and so on!!! The Manels anniversary sale runs from July 13-17. Don't forget to check their items out!